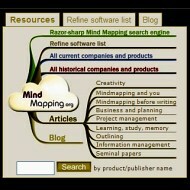 The Master List at Mind-Mapping.Org claims to have every concept mapping, mind mapping and related type of visual organizer there is (or was). Well, to be honest, new ones keep appearing and get added to the foot of the To Do list. But “every one there is” is the aim. At the time of writing, there are 377 entries: 290 being current software and 87 historical, making this the most comprehensive source on the Web. If Top Picks are not comprehensive and detailed enough for you, The Master List is what you need. To search the Master List, go to its front page for hundreds of visual tools, with thumbnails, full-size screenshots, descriptions, prices and links, with some added commentary. Use the tabbed area at the top right of that page to find exactly what you want – the tab “Refine software list” pictured above gives finer grained controls to filter you see listed.